Eleanor Ryan Doyle scored two for Peamount in Greenogue. IT PROMISES TO be a fascinating title race full of twists and turns in the Women’s National League this season, with Saturday night seeing Peamount United deliver a massive performance by beating defending champions Wexford Youths 2-1. The Dubliners exacted revenge for their FAI Cup final defeat at the Aviva Stadium five months ago, securing a pivotal three points in Greenogue to boost their chances of bagging a first league title since 2012. A double from Eleanor Ryan Doyle, including a long-range effort which sailed into the top corner, saw Peamount surge into a two goal lead before Youths skipper Kylie Murphy halved the deficit with a little under half an hour remaining. "With what happened at the Aviva last year, we were really up for it and knew what we had to do..."
The South Dublin club held on to secure their third win in as many games. Peamount now go level on points with league leaders Shelbourne and Wexford in a three-way battle for the title — with Youths having played a game extra. Saturday also saw Limerick secure a big win of their own away to Kilkenny United. The hosts had yet to secure a single point all season, tasting defeat in their three successive games this season. 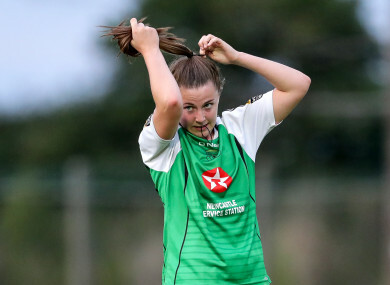 Sylvia Gee broke Kilkenny hearts, however, bagging a late winner in stoppage time to earn Limerick their first win of the 2019 campaign. Email “Ryan Doyle double sees Peamount deliver massive win against champions Wexford to ignite title race”. Feedback on “Ryan Doyle double sees Peamount deliver massive win against champions Wexford to ignite title race”.